After introducing our Super Science Club last week, let's get to work! As our first project I would like to introduce Creator Recommendations. On Tapastic we have gotten used to the website advertising for us. We rely on Snacks, Staff Picks, and the algorithms that decide if we make it into the popular section. As creators we tend to stay to ourselves and work alone. In contrast to that, rare community projects like the Christmas Specials show how strong our output can be when we work together. Since we can not change the website, we can instead use the tools we have available for good. I challenge you to introduce your readers to other comics that you enjoy with the help of your Banner. If you like a comic, chances are that your readers will like it too. Here is my first banner. The empty spot is for the other creator's artwork. You can use this as an idea of how your banner can look, but feel free to develop your own design solution that fits your esthetics best. I will also write a little wall post about this comic to explain, why I enjoy it so much. Every month or so I will swap it with another comic, preferably one with less subscribers than I have. I am interested to see what my readers think about this and if we can get enough creators to follow suit to make an actual impact on where and how our readers find new comics. Please note that your readers coming from the app will not see this banner or your post as they are pretty cut off from our normal community interactions. I like this idea, but I'm concerned how it might look on mobile devices. IIRC the safe area is quite small and is at the dead center. I have to be honest that I expect most mobile users to view my comic using the Tapas App, which does not seem to show banners anymore. That's why I pretty much ignored the old guidelines we used. But depending on feedback I gladly update the design. I know some people avoid the app even on mobile for various reasons. I think we can give this a try, though, and make tweaks to the template as we go along? Oh absolutely. I feel like creators will make their own individual design anyways. It would be great to see banner designs posted here for reference! Tapas App, which does not seem to show banners anymore. Just wanted to confirm this and show an example of what a series looks like on the app. Definitely no way to really apply this to the app, I don't think. Unless you add a line in the series description or in the episode description. However, links are hard to follow on the app and that would be a bit cumbersome to include a creator recommendation in those description areas. I think the site it only place to truly utilize this. I love the idea of cross promoting and I think readers get a kick out of it too. On a webcomic's actual official site, it's not uncommon to see a Links page that is filled with the creator's webcomic reading list. 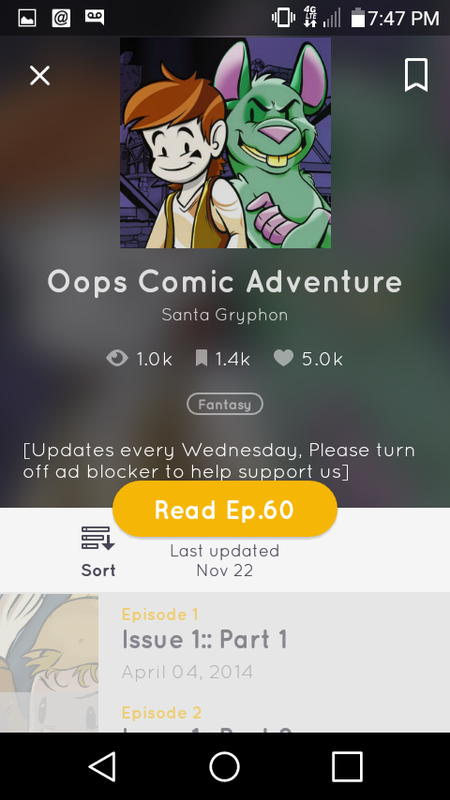 I think this is a clever idea to bring that concept to the Tapastic platform. Another option might be to use the small custom banner at the end of the series for a Creator Recommendation. In case, creator's want to reserve their big banner area for Patreon/Kickstarter links and such. Since we can not change the website, we can instead use the tools we have available for good. I have so many I'd like to shout out are awesome! I agree. And that is unfortunate, but since the app is not really built for us and more for comics not coming from this community, we have no choice but to build our efforts around the website instead. The options are (almost) endless! Oooh. I'm not sure I'll do this with my header-banner, but this might be interesting to do during my chapter-breaks from now on! I take a week off between chapters, and doing a small recap-episode that ends with a recommendation for another comic would be nice! That is also a very lovely way of doing this! like the idea but to be honest i dont want to mess with my banner. I have however got another idea to share. in the past i did a post asking people for designs to use on pj's in my comic (sadly i only got one person take part) but the point is promoting each other in comic backgrounds (such as posters on walls) and on clothes is a nice way to support each other. I'm following the discussion, but I had really nothing specail to say until I saw your pjs! I regret never ending up doing that pj (although I meant to), but I think that your idea is very effective and straightforward. I also don't want to mess with my banner. Other ideas: adding characters from other people's comics into our regular comic, even just as background figures, or, better yet, interacting for at least a panel with our own characters would also be awesome. And don't forget posters for other comics: you could have those easily up in a city setting, for example, or in a tavern. Or in a cave (that would be creative ). I think I might also try @AnnaLandin's idea of doing recaps with creator recommendations at the end between chapters as well. That really sounds like a nice idea. On the website we could put recs to the side in that little ad space we've got… I've got my "Vote on TopWebComic" link right there, but I feel like a rec would be cool!! It'd be a little less visibility, but it would be a comfortable place for people who don't want to mess with their banners but still want to give a shout out! And I think I'll probably do recs between chapters, like Anna suggested. can you direct to where i can learn about adding buttons and such to the top banner? You can't actually add buttons to the top banner, but you can make the whole top banner a link to something -- if you go to edit your series (go to your dashboard, click the little pencil icon on your series) then right under where you add the Series Cover Banner is a space for the "Series Cover Banner Link," which you can leave blank or set to anything you want. A lot of times you can click someone's top banner to go to their patreon or their main website. As for me, I'm not sure how I feel about the idea of adopting this! There's such a big difference between saying "I really recommend this good comic as a creator!" and associating that comic's brand with your own. I guess it's something to ponder! mistery friggen solved <'D thanks! the fields must have mixed with the promo image/link ones when i was there in the past. I'll try this, now my problem is to choose who will be the first victim hahaha. how about we have a thread where we can post a poster for our comic that other creators are free to use in the backgrounds of thier comics? it would also make it kinda fun to see where we spot these things showing up.